Do you have a bare-metal recovery plan? Burn a customized, hands-off restore CD for every system on your network. Bring your most complicated NFS challenges under control with a versatile utility. Are you wasting your company's bandwidth just to risk getting on the wrong side of the law? Put a stop to it with a Linux firewall. You've got IPv6 compiled and working—now match some convenient names with those inconvenient 128-bit addresses. William presents the fundamentals of the vi editor. Send your photo subjects back in time with these techniques that re-create the look of old prints. Learn the fundamental technique behind the next generation of privacy-conscious peer-to-peer systems. Walk through a hardware design cycle with new tools that are bringing electronic design automation to our favorite platform. 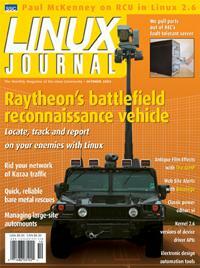 Linux is bringing sensor data and user interface together for an innovative new military vehicle.